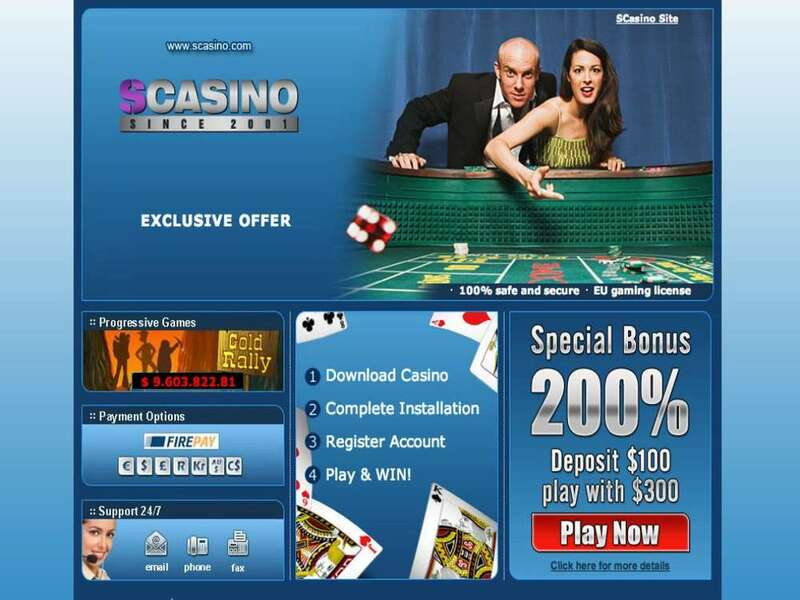 Founded in 2002 and operated with one of the most prolific providers in the industry, SCasino is perhaps one of the most established and oldest casinos in the online sphere. Promising to deliver all the luxury and glamour of Las Vegas life, this established platform has got people talking about it for years due to its fantastic bonus package, a slick interface and an impressive collection of games. SCasino Online Casino is owned by ElectraWorks Limited and is licensed under the Gibraltar Gambling Commissioner. This means that all the players who wish to play on the platform are assured of safety and security, especially when it comes to real money matters. In addition to assuring you of your security, SCasino also prides itself in excellent customer support services. Besides, it offers round the clock customer support services. SCasino is exclusively powered by Playtech. This software development company is responsible for providing all the games at the casino. As with most of the other online casinos, players visiting SCasino can enjoy the games free of charge, with the exception of the live dealer games. Also, you cannot play the jackpot slot unless you’ve logged in as a member. Even then, you’ll be able to play the jackpot games for free without the jackpot attached to it. There’s a controversy surrounding who powered the first online casino. Some claim it was Microgaming, while others claim it was Playtech. But it’s certain that the first European online casino was powered by Playtech back in the early 2000s. This makes Playtech an established company with years of experience. It, therefore, goes without saying that SCasino benefits from a software provider with years of experience. This makes the user experience on the site exceptional. Signing up or logging in to the casino is a pain-free process. All the buttons have clearly been labelled to make navigation smooth and a breeze. Also, the games load super-fast. All you need to remain connected to the casino perfectly is a medium-strong internet connection that’s also very stable. Perhaps, one of the strongest section of the casino lies in its games collection. Some might claim that it’s powered by one software provider, so there’s no point of arguing about it. However, in reality, this is the biggest plus. Instead of including hundreds or thousands of slots from many software providers, SCasino has chosen to include only Playtech slots. This means that you’ll be having access to 200+ casino games belonging to the Playtech portfolio. Indeed, SCasino Casino has undeniably excelled in the game collection. They offer bettors a diversified range of options that fit all budgets and tastes. Scrolling through the game section will reveal a lot of games to choose from. There are even advanced features that make it very easy for you to find a game and start playing. Just to give you an overview of what to expect, there are video slot games. You can choose to play these fast-paced games, which can be accessed through mobile and PC platforms. These games are obviously the main attraction at the casino, and it, therefore, comes naturally that SCasino online includes a diverse range. Popular titles that you can choose at the casino include the likes of Beach Life, Buffalo Blitz, and Dolphin Reef among many others. This combines with equally celebrated progressive jackpot slots such as Age of Gods promise to keep you reeled in and entertained for hours. To complement the slot games, there are also the table and card games that are widely played at the land-based casinos. Therefore, if you feel a little bit lazy to make a short trip to your favourite land-based casino, you can as well log into SCasino and see what they have to offer. You can also choose to play well-known casino favourites such as Blackjack, Baccarat and Casino Hold’em. There are even video poker games for those players looking to have a quick fix. In 2018, online gambling platforms need to stay up to date when it comes to mobile compatibility. If you want to remain relevant, even in terms of Google standards, you have to ensure that your offerings can be accessed on mobiles. And SCasino checks all the boxes in this section, offering a smooth and enjoyable gaming experience to players who like playing on the go. Later on, in the SCasino review, we’ve looked into deeper details and what’s there to benefit from the mobile platform and the overall playing experience. Drawing inspiration from some of the popular land-based casinos, SCasino now boasts of 11 (eleven) high-definition live casino games. Out of the eleven, one has been fully optimised for play on mobiles. This doesn’t mean that you can’t play the others on mobile, no. Only that as you play, you might experience some difficulty if your device doesn’t have high specs. 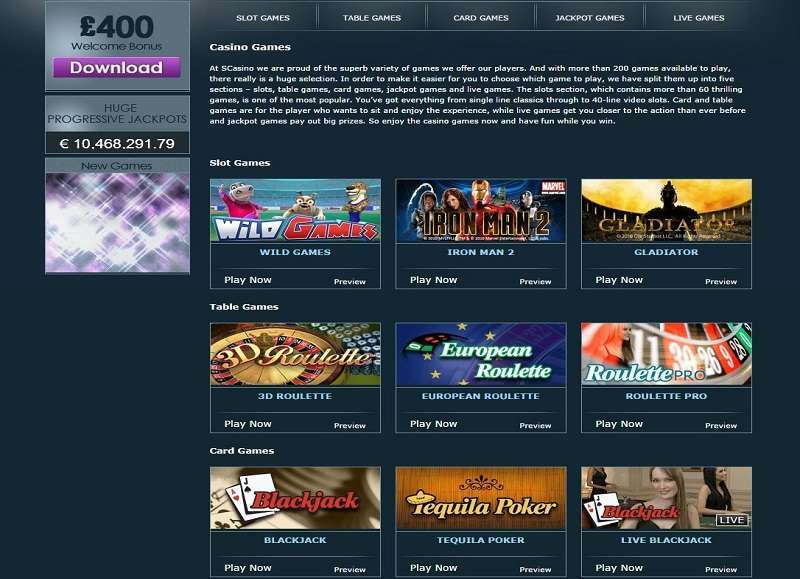 Because SCasino online is backed by a reputable licensing company, you can rest assured that your experience will not only be entertaining, but it will also be safe. Live casino gaming at SCasino has been checked, certified and regulated by the Gibraltar Gambling Commissioner according to the Gambling Act of 2005. This means that all the gaming action is 100% fair. Besides the impressive collection of games lined up at the casino, SCasino also shines up with its welcome bonus offer. It shines and stands out in the sense that you are given two option to choose from. This breaks tradition from what most of the other sites give you. The following is a quick break down of the SCasino bonus offer. Offer #1: The 100% Match Deposit Bonus. 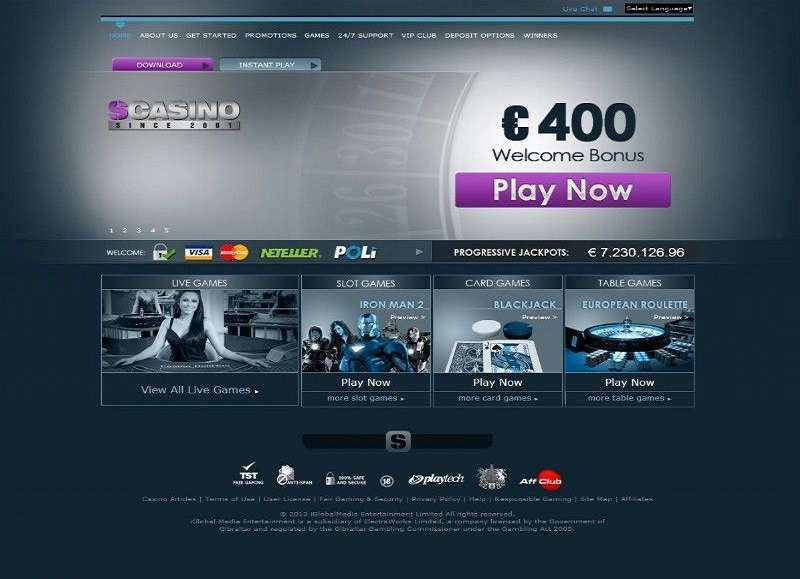 You are awarded a 100% match deposit bonus up to a maximum of €500. If you choose to go for this, you are expected to make a minimum deposit of €20 and a maximum deposit of €500 to receive a 100% match deposit bonus. Offer #2: The 20% Cashback Promotion. If you opt for this, you receive a 20% cashback on your first deposit. The minimum you need to deposit to qualify for this is set at €20, while the maximum is set at €500. You have to use the bonus code CASHBACK to receive this cashback amount. Naturally, you would automatically be awarded the bonus money upon signing up. But as for SCasino, you have to opt-in to claim the bonus. Failure to do this when signing up will result in your bonus cash being forfeited. Also, the terms and conditions apply to both bonuses as do the wagering requirements. Just make sure that you read the small print before claiming the bonuses. Returning players at SCasino are entitled to other promotions and bonuses. This is why the team at SCasino has four additional bonuses and promotions for you to choose from. They include the Free Spins Golden Chips, Slot Bonus, Cashback, and Table Bonus. You have to select any one of them, but you cannot enjoy all. Available Promos: Welcome, Free Spins Golden Chips, Slot Bonus, Cash Back and Table Bonuses. Wagering Requirements: 40× the bonus money. Players Eligible: Anyone who’s above the age of 21 and resides in a country where SCasino can offer its services. The difficulty of Claiming the Bonus: Easy to Medium. Depositing and withdrawing funds at SCasino has been made simple, fast and very secure all thanks to the highest SSL security protocol put in place. You can choose to use any one of the following methods to make your transactions. All these options are accepted across different European countries including the UK. This means that even when you decide to travel to the Netherlands, Germany, Sweden or France, you can still be able to make a deposit and withdraw your winning without any problem whatsoever. At SCasino, the minimum deposit is set at €10, and there’s no maximum limit. If you wish to have a maximum limit, you can always click on the responsible gaming page and choose the limits feature. Deposits are made instantly, so you’ll be able to start playing within no time after making your deposit. As for withdrawals, they have different processing times. Payments requested through e-Wallets are processed within a maximum of 24 hours, while credit and debit card payments take up to 5 days. Overall though, these payments are processed safely and securely thanks to the encryption technology SCasino uses. The industry SCasino finds itself now is quite different from what it was back in 2002 when they started off. To remain relevant in this fierce competitive industry, online casinos need to offer the best of the games, especially when it comes to mobile compatibility. This is because more and more people are joining in the fun whilst on the move, the factor that demands casinos to deliver the best gambling experience. And SCasino does this. The casino’s tablet and mobile platforms are remarkably user-friendly. They are easy to navigate and lose no appeal when compressed from the PC to mobile/tablet platform. 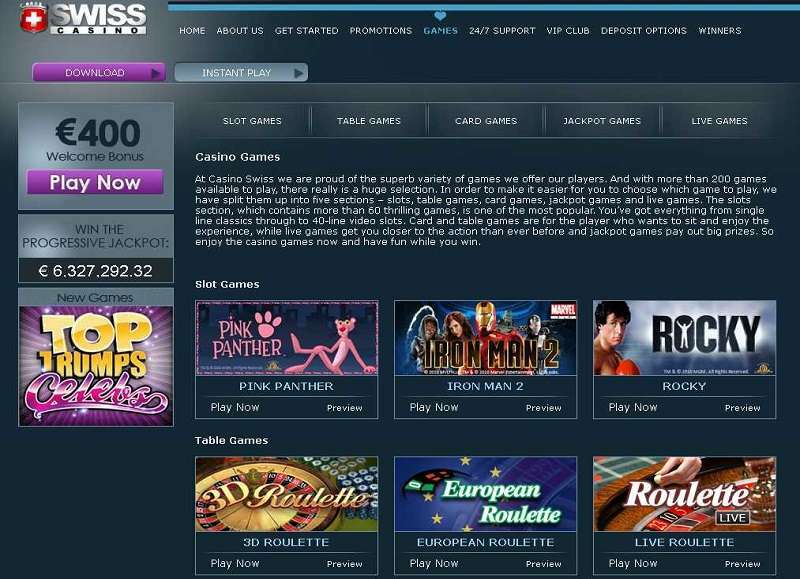 All the games offered at the casino are readily accessible through the instant play, so there’s no download required. Sophisticated, slick and smooth. These are the adjectives used to describe the user experience at SCasino. Their website oozes the luxurious land casino gaming vibe. They entice players with the allure of offering a gaming experience similar to that of the land-based esteblishment. To do this, they’ve used banners and images picked straight from the casino. The site has also focused on ensuring that you can pick your favourite games easily. You can use the common search feature to look for the games that you are already aware of. You can also opt to list the games from A-Z to easily pick a title. The games can also be arranged in titles or list form to fit your device’s screen. If for a minute you’d think that your mobile gaming will be hectic due to lagging, then think again. Playtech’s software ensures the games load fast provided that you have a stable internet connection, and your browser is using the latest up to date Adobe Flash Player. Does SCasino have what it takes to be rated as one of the best casinos in the online gaming industry? Well, it’s an old casino and the fact is that it has managed to remain not just afloat for all these years but amoung the leading platforms with no scandals. Their website is impressive, they have plenty to offer in terms of bonuses and promotions, and their terms and conditions are plainly laid out on the site. So, it’s worth saying that yes, SCasino has what it takes to be categorised as one of the best casinos in the industry.